[prMac.com] Saint-Petersburg, Russian Federation - Elecont LLC today announces Weather Map HD 1.2 for iOS, an update to their universal app for travelers, weather enthusiasts, fishers and virtually everyone. New version provides useful information for planning beach activities such as swimming or fishing. Planning a day at the beach or a boating trip? Are you curious about what the water temperature is at your favorite place to swim? Weather Map HD is the fastest, easiest-to-use, weather application that displays current weather conditions and sea surface temperature directly on the map. Additional information, presented in pop-up window, includes "feels like temperature", humidity, wind speed, wind direction, local time, sunset/sunrise time and ten-day weather forecast. 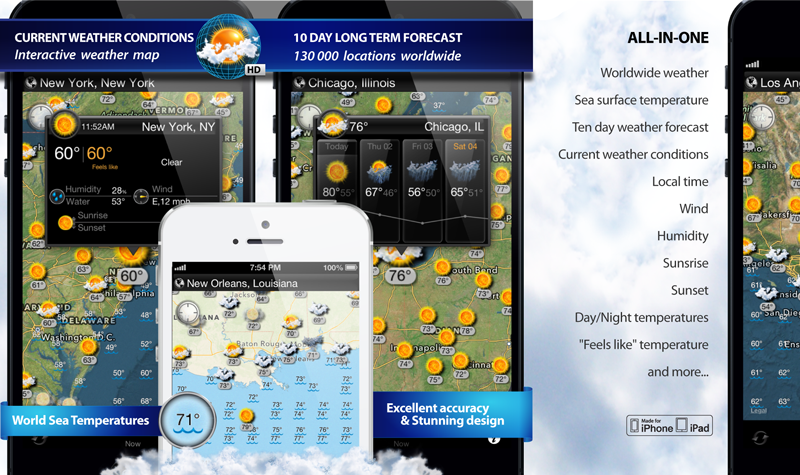 For a limited time, Weather Map HD 1.2 is offered at an introductory one-time fee of $0.99 USD (or equivalent amount in other currencies) and available worldwide exclusively through the App Store in the Weather category. There are no subscription fees or hidden costs. Elecont LLC is a fast growing software development company specializing in the mobile market, developing software solutions for Android, iOS and Windows Mobile devices. Elecont LLC was founded in 2007 and its primary offices are located in Russia. Copyright (C) 2012 Elecont Software LLC. All Rights Reserved. Apple, the Apple logo, iPhone, iPod and iPad are registered trademarks of Apple Inc. in the U.S. and/or other countries.